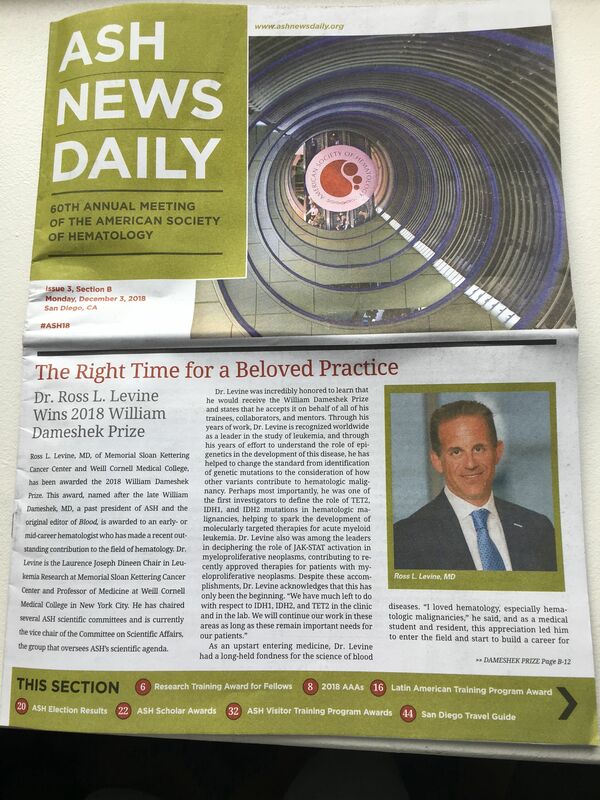 On Sunday, I reported on a press briefing at the 60th ASH Annual Meeting where the preliminary findings of our Beat AML Master Clinical Trial were unveiled. This innovative collaborative study is designed to bring the hope of precision medicine to patients with acute myeloid leukemia (AML). (Read about our Friday ASH satellite symposium on immunotherapy here). On Monday, Amy Burd, Ph.D., LLS’s vice president of research strategy and lead on the study, presented the findings again; this time to more than 2,000 world-class scientists. The Beat AML Master Clinical Trial is using genomic technology to identify the patient’s type of AML so they can get a targeted therapy to treat their disease. The study has been open for two years and is now enrolling patients in 11 different study arms at 13 centers. To the question: Can we assign patients to therapy within seven calendar days of samples arriving at the processing lab? Burd's emphatic response: "The answer is yes! We’ve achieved our primary endpoint of assigning therapy within seven days to over 95% of the patients." We also learned on Monday that Burd’s Beat AML abstract, along with the abstract regarding the Beat AML study arm for the IDH2 inhibitor enasidenib, by Eytan Stein, M.D., of Memorial Sloan Kettering Cancer Center, will be showcased in today’s “Best of ASH” session, which features studies the committee has deemed to be among the most important breakthroughs presented during the ASH conference. Cleary, this is a significant honor for LLS; Best of ASH data are presented throughout the year at ASH satellite meetings around the country. The studies will also be featured in a “Highlights of ASH” publication. Burd’s presentation yesterday kicked off an early morning scientific session focused on trials of novel therapies in AML that work by interfering with the genetic mutations that drive the cancer cells. It’s been a whirlwind two years for AML therapies, with nine approved since the start of 2017. Some of these newly approved agents were in the spotlight at Monday morning’s session, including ivosidenib and enasidenib, two therapies that target the mutations IDH1 and IDH2, respectively; gilteritinib, a new drug that just received FDA approval on Nov. 28, targets the FLT3 mutation in AML; and venetoclax, a drug that helps rid the body of damaged cells and received FDA approval on Nov. 21 to treat elderly AML patients (it had previously been approved for chronic lymphocytic leukemia). Quizatinib, another FLT3 inhibitor that is under FDA review with a decision anticipated later this year, was also discussed. Overall, response rates for these new therapies, both as monotherapies and in combination with standard chemotherapy, have been encouraging, giving doctors and their patients many new options and new reason for hope when given an AML diagnosis. 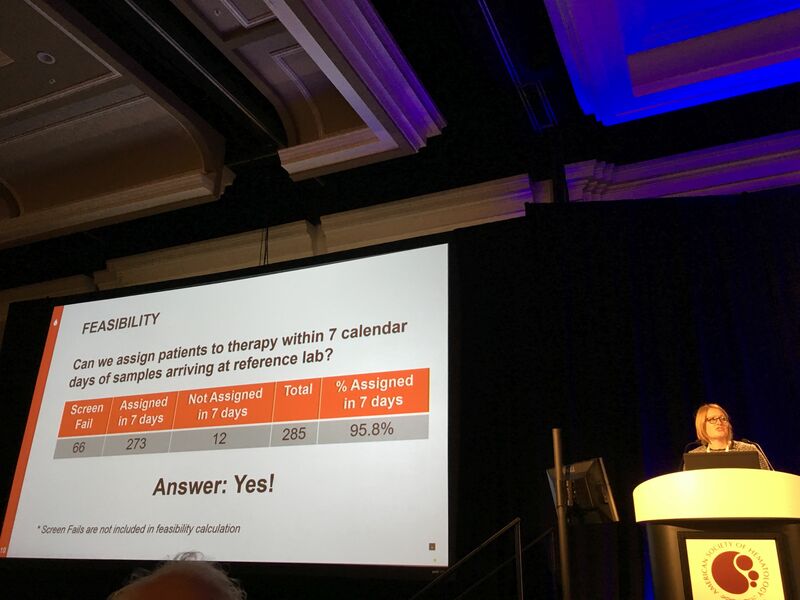 Three of these therapies are also being tested in the Beat AML study as first-line therapy: ivosidenib, enasidenib and gilteritinib, though the data presented at this session were from different studies. Over the past two years, the FDA has approved 37 therapies to treat blood cancers. Some of these are entirely new agents, while other approvals are for new indications of previously approved treatments or new dosing regiments. With so many new therapies in the toolbox, clinicians and scientists are now trying to figure out the right cocktails of treatments. Multiple studies presented these past few days addressed this puzzle: What is the right combination of these therapies to optimize outcomes for the patient? Doctors are also trying to understand why some patients respond while others are resistant to treatment. Are there biomarkers to give us clues about who will respond and who won’t? Two therapies that came up frequently in studies of different combinations, were the aforementioned venetoclax, and ibrutinib, a drug that targets a protein called Bruton’s tyrosine kinase (BTK), which plays a role in cell growth and when its levels are too high, allows for proliferation of cancer cells. Ibrutinib is currently approved for chronic lymphocytic leukemia, Waldenstrom’s macroglobulinemia and mantle cell lymphoma. The Leukemia & Lymphoma Society (LLS) has played a significant role in supporting research over many years for both of these game changing therapies. As with other blood cancer therapies, both venetoclax and ibrutinib might have applications in solid tumor cancers, and clinical trials are underway in breast, pancreatic and prostate cancers. Both are already changing the standard of care for multiple blood cancers. The most compelling results are when these two drugs are being tested together to improve treatment for CLL. The results of one study show that in many cases the cancer was completely eradicated, leaving no trace of cancer cells, known as minimal residual disease. Venetoclax is also being tested in multiple myeloma combined with antibody drugs. Its recent approval in AML was in combination with different types of chemotherapy. One of the highlights of ASH is the Plenary Session: studies selected for this event are considered “practice changing” and the presentations are held in the largest halls, allowing for many of the thousands attending the meeting to hear about the most impactful findings. There is a growing trend in cancer to move away from toxic chemotherapy toward targeted and immunotherapy treatments. 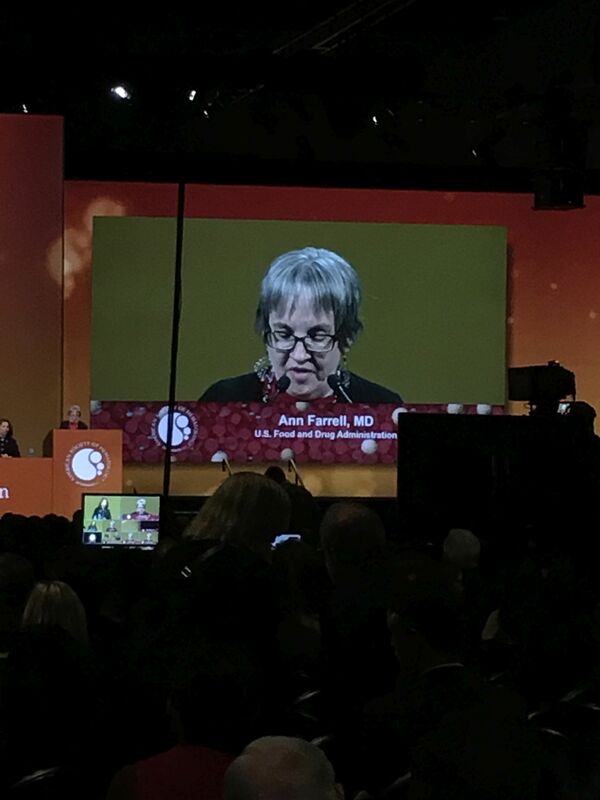 One of the presentations, given by Jennifer Woyach, M.D., of The Ohio State University, showed that ibrutinib is truly a game changer in treating CLL. Her team’s study shows that ibrutinib, either alone, or in combination with the antibody rituximab, is far superior to the current standard of care for CLL, which is a combination of the chemotherapy bendamustine, with rituximab. In fact, the study arms with ibrutinib alone performed equally to the study arm with ibrutinib and rituximab, hinting that rituximab might not even be necessary in this regimen. “This study represents part of a paradigm shift away from chemoimmunotherapy toward targeted therapy for most older patients,” Woyach said. 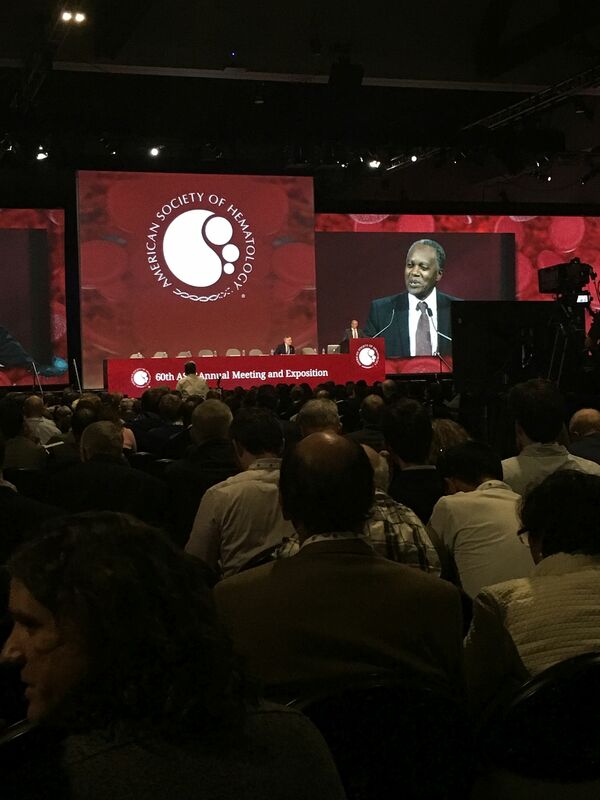 Another Plenary presentation showed work supported by LLS through our Translational Research Program in which the gene editing tool, CRISPR, was employed to identify the molecular aberrations that cause a rare and particularly aggressive type of leukemia called acute erythroid leukemia (AEL). The study identified age-related AEL subtypes and the team is now testing these genetically defined subtypes of AEL for their sensitivity to different targeted drugs. And here is a compelling reminder that ASH is about more than the blood cancers: the organization is also focused on other blood diseases including hemophilia and sickle cell disease. One of the most moving sessions of the ASH conference was a Plenary presentation by Leon Tshilolo, M.D. Ph.D., Sickle Cell Director in Kinshasa, Democratic Republic of Congo. The highest percentage of children suffering from the painful sickle cell disease are in sub-Saharan Africa. Tshilolo's team studied the impact of giving children hydroxyurea, a standard treatment for the disease but one that had never been studied prospectively in this patient population, where challenges such as malnutrition and infections are a factor. The results show that if these children could have access they would clearly benefit from daily treatment with this oral therapy. • On Monday, more data was presented on chimeric antigen receptor (CAR) T-cell therapies for multiple myeloma. The target for these engineered T-cells is a protein on the myeloma cell surface called BCMA (b-cell maturation antigen) and multiple biopharmaceutical companies are vying in this space including Janssen, Juno, Bluebird and Celgene. Several of the studies showed strong response rates, in the 80 percent range, but more time is needed to determine its durability. • Stemline, a company LLS supports through our Therapy Acceleration Program, presented compelling data for its therapy tagraxofusp/SL-401 (Elzonris™) to treat a rare but challenging blood cancer called blastic plasmacytoid dendritic cell neoplasm (BPDCN) that presents with skin lesions. Stemline’s study showed an overwhelming overall response rate of 90%, and the therapy is currently under FDA review. Ross Levine, M.D., of Memorial Sloan Kettering Cancer Center, received the prestigious William Dameshek Prize, named for a past president of ASH. Levine is a co-lead of LLS’s Beat AML Master Clinical Trial. The Dameshek Prize is awarded to an early to mid-career hematologist who has made a recent outstanding contribution to the field of hematology. Levine has helped define the role of genetic mutations that play a role in AML and myeloproliferative neoplasms. Ann Farrell, M.D., director of the Division of Hematology Products at the FDA, and one of the panelists at our roundtable Thursday night, was given the 2018 ASH Outstanding Service Award, an honor recognizing her leadership in advancing partnership between FDA and ASH. Farrell has been a guiding force and a strong advocate for our Beat AML Master Clinical Trial, and has provided invaluable input on our protocol. Ross Levine, M.D., of Memorial Sloan Kettering Cancer Center, received the prestigious William Dameshek Prize, named for a past president of ASH. Ann Farrell, M.D., director of the Division of Hematology Products at the FDA, was given the 2018 ASH Outstanding Service Award.